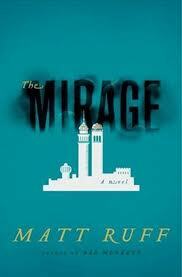 The Mirage, Matt Ruff’s new novel, is based on a striking reversal of history. Set in the Islamic and democratic United Arab States, it opens with the traumatic events of November 9, 2001, the day a group of radical Christian terrorists hijacked four planes. The terrorists flew two planes into the Tigris and Euphrates World Trade Towers in Baghdad, and a third into the Arab Defense Ministry building in Riyadh. Now, in the aftermath of 11/9, three agents with Arab Homeland Security discover a secret that pits them against the crime lord Saddam Hussein and the chairman of the Senate Intelligence Committee, Osama bin Laden. The Mirage is more a mirror-history than an alternate: while set in the “U.A.S.,” it’s really about the U.S.A. The implications of this mirror-trick take shape when the three security agents find a weird artifact in the apartment of a suspected suicide bomber: a New York Times newspaper from September 12, 2001. The goal of the characters through most of the book is to find out what that alien newspaper means–and whether it’s real, or just a mirage. A lot of people, I suspect, are going to read The Mirage. They’ll read it because of its gripping concept, and because they’re eager to see a new take on 9/11. They’ll read it because they want to see Muslim characters portrayed with sensitivity, something Matt Ruff does well. By and large, he succeeds in crafting a varied Islamic world, with different kinds of Muslims–Sunni, Shia, doubting, lapsed. There are also Jews, who have a comfortable relationship with Arabs, as Israel is now located on the Baltic Sea. There are Christian Arabs, Russian Orthodox, and a variety of extremist Christian groups, who have broken North America into fundamentalist dictatorships. Part of the fun of The Mirage is turning this upside-down world over again, and catching a glimpse of our own reality. Twirl Matt Ruff’s globe around a few times, however, and a curious gap emerges. The Mirage pits a democratic Islamic state against Christian fundamentalist terrorists who, in a clever bit of historical sampling, call themselves “crusaders.” Every country has a religion, and an Abrahamic religion at that. There is no secular state. This is strange, because it results in a reversed version of the U.S. that is missing the secular voice–a voice that wields a good deal of power in the world we know, and one with a specific position regarding not just Islam, but all organized religion. Jewish, Christian and Muslim perspectives, however much they differ, share a good deal, especially when placed opposite a secular worldview. The similarities are even stronger when it comes to extremists, which is why it works so well for Ruff to change the 9/11 attacks into attacks by crusading Christians. His careful portrayal of Muslims is laudable, but by making their enemies Christian extremists he misses the chance to portray any version of the secular West, from which he will probably draw a large proportion of his readers. One might argue that Samir, a non-practicing Muslim character, is meant to stand in for a possible secular reader, but Samir lives in an Islamic state, and his position within it is weak. What’s missing from The Mirage is a secular voice with power. By leaving a culture like that of the U.S., with its strong secular influence, out of the picture, The Mirage gives the non-religious reader an easy out, and might even be taken to suggest a link between religion and violence–an idea that is not exactly new. This means that while The Mirage is a fast-paced and clever thriller, it never crosses the line that would make it a thought-provoking meditation on history. It remains a colorful spectacle of religious folks fighting each other–an entertaining, but not at all challenging, mirage.